Maneater. Beautiful reddish brown creme, or dare I say, jelly? It's dark but still looks brown and not black. Holiday. Ooooooh! A bright pinkish-red with tons of sparkle- same vein as Shut Up And Drive and Lady Marmalade. I'm thinking this is a re-release because the name sounds familiar and I could have sworn I saw this in a holiday set at Nordstrom or something. I would totally wear this. SUPERSTAR! Brown and gold glitter! It's a brown jelly base with golden brown glitter. I'm in LOVE with this! I don't own a single color that looks even remotely like this. A winner in my eyes. Icing On The Cake. A pretty, delicate yet super streaky metallic silvery whitish pink. Very 'dainty'. Super streaky, though. This reminds me a ton of those old Sally Hansen Crystal Chrome polishes they used to have- I'll have to dig a few out to compare- could be a dupe of Petal Chrome? Comes in an adorable black/blue shimmery snakeskin bag. I love it, I can't stop admiring it. Devil In A Blue Dress. Deep, dark navy blue creme. Looks almost black on the nail. Good Girl Gone Bad. 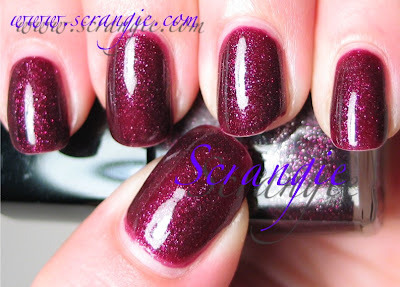 Stunning mellow burgundy glitter. I think I need nine or ten backups of this. I could wear this every day. It's so beautiful! And it was super easy to remove- rare for a glitter polish! Overall, these ROCK! The formula is magical- applies so smooth and even, it's almost as nice as Rescue Beauty Lounge. The bottles themselves are great to look at, they're some if the prettiest bottles around. I would 100% recommend these for anyone looking for a more interesting glitter shade or a unique creme polish. Love them all. Great job, Lippmann!! Gorgeous swatches once again!! I was so excited for Superstar and Maneater but they both look like polishes that I may be able to skip...I just can't do chunky glitter and I have some brown cremes coming (including the one I'm most excited about--Misa Fashion 4 Passion)...hopefully they'll have satisfy me enough so I don't need to go get Maneater!! And I have no idea how to get hold of them. Another challenge in my life. Love yoour blog. Have I told you that lately? LOVE!!! Icing On The Cake looks a bit like OPI's Fee Jee Wee Jee Fawn ? No! Stop it! My lemming list is already so long it's unlikely I'm considering growing a few more hands. GGGB is lovely! I don't *want* to want this... but that's only because of my wallet. Ohhhh Good Girl Gone Bad looks delicious! Oh no, I really want that one! I don't know how but I want! These look amazing! Do you know if you can buy Good Girl Gone Bad seperately, or does it just come in the set? 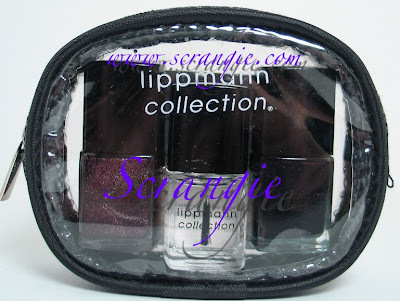 Also, (and this is a little sad), where does one get Lippman polishes? I've really tried to limit my brands to save money, but after seeing your swatches, I may have to add one more. Fudge, hmm, you know I think I have that one somewhere, I will have to compare! That would be a great alternative to buying a $15 polish! FauxFun, thanks! It's definitely my favorite out of them all, and I don't think I have any other colors like it! scrangie, i got the name wrong its Fiji Wee Jee Fawn! 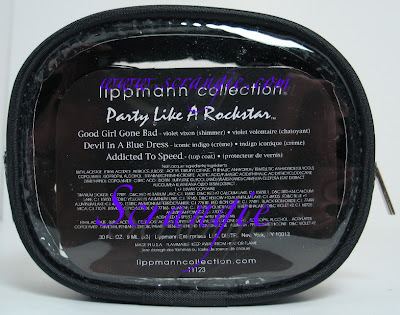 I bought the rocker collection! I LOVE good girl gone bad. I had to try it immediately over my Essie Honey Bun - pretty!!! And I bought brown eyed girl and layered over the Essie Lady Godiva on my toes - again luscious! mmmmmmm - can't wait to try devil in a blue dress and I'm not used to wearing anything that "wild". bought online at lippmann - only took 4 days. Deepo, aren't they GORGEOUS?? I love em! I was really pleased with the whole collection! Just put on Devil in a blue dress - love it but I went further. I put Lippmann's Dream A Little Dream on top. It's a clear with blue glitter but goes on smooth. Adds fabulous depth to Devil - even in the dark it glimmers. looks like the night sky with constellations! Deepo, that sounds AWESOME! Now I want to try layering it! !